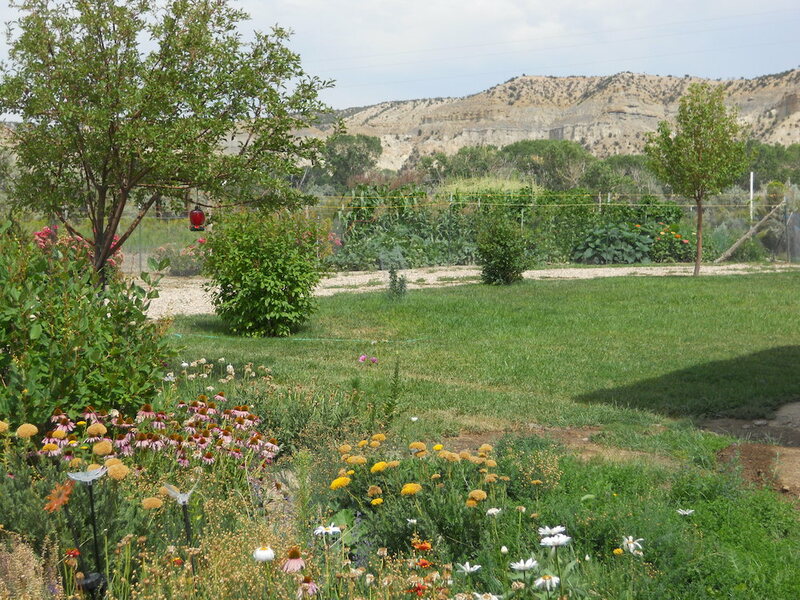 Gardens of wildflowers and home-grown vegetables grace the grounds in front of Sunrise Hollow. You will pass them as you proceed to your dedicated parking space. The spacious great room at Sunrise Hollow features leather couches, a flatscreen TV, and a sleeping nook with an extra queen bed! 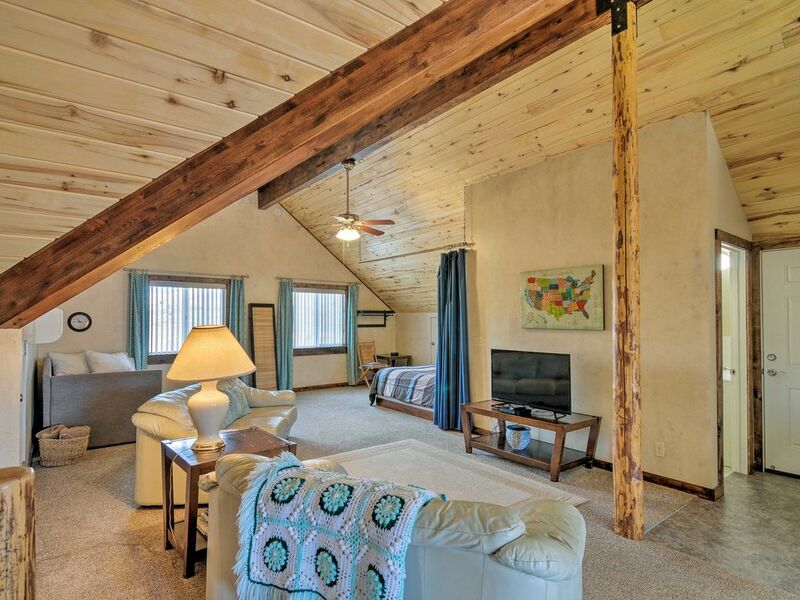 Notice the rustic cedar posts and aspen-lined ceiling. 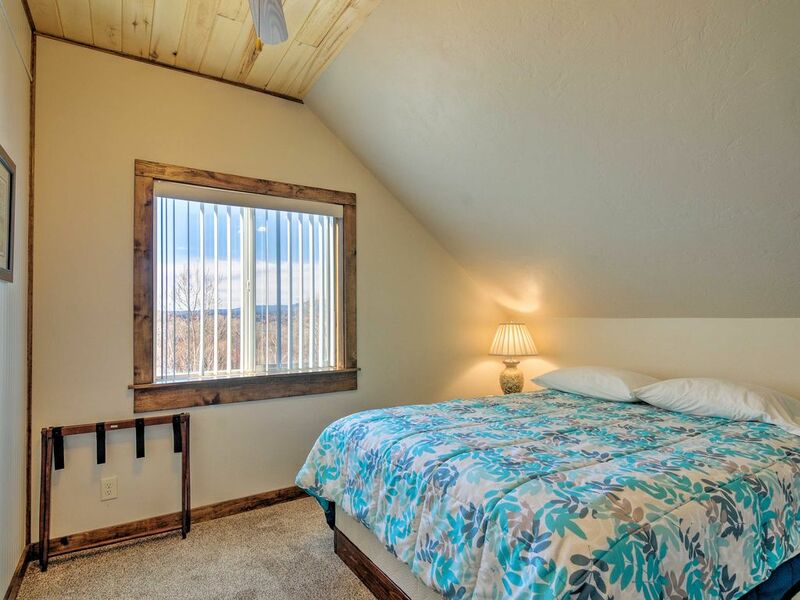 Sunrise Hollow's first bedroom features a knotty aspen lined ceiling, a ceiling fan, an elegant wardrobe, a comfy queen bed, and private climate control. 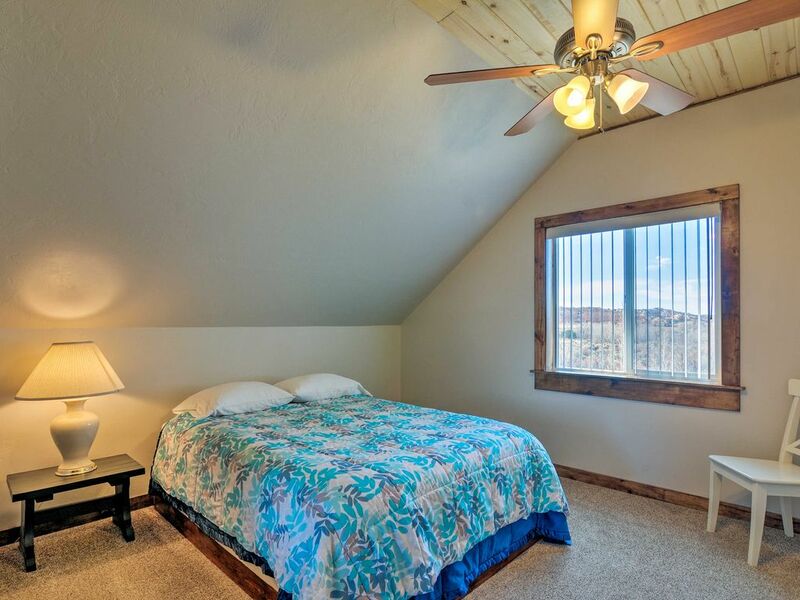 The first bedroom at Sunrise Hollow features a comfy queen bed, ceiling fan, knotty aspen lined ceiling, and panoramic views of red rock country in the distance. 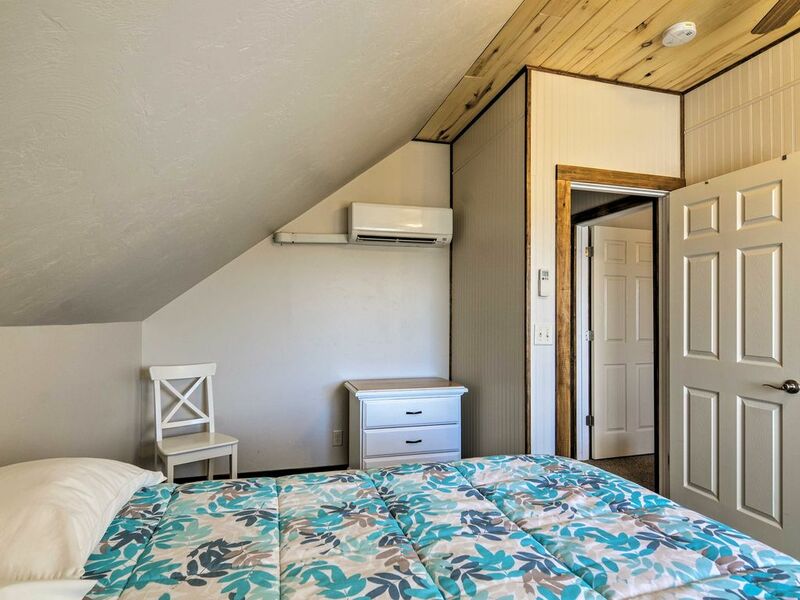 The second bedroom at Sunrise Hollow features a comfy queen bed, knotty aspen lined ceiling, and a ceiling fan, plus a panoramic view of the rim of Bryce Canyon in the distance. 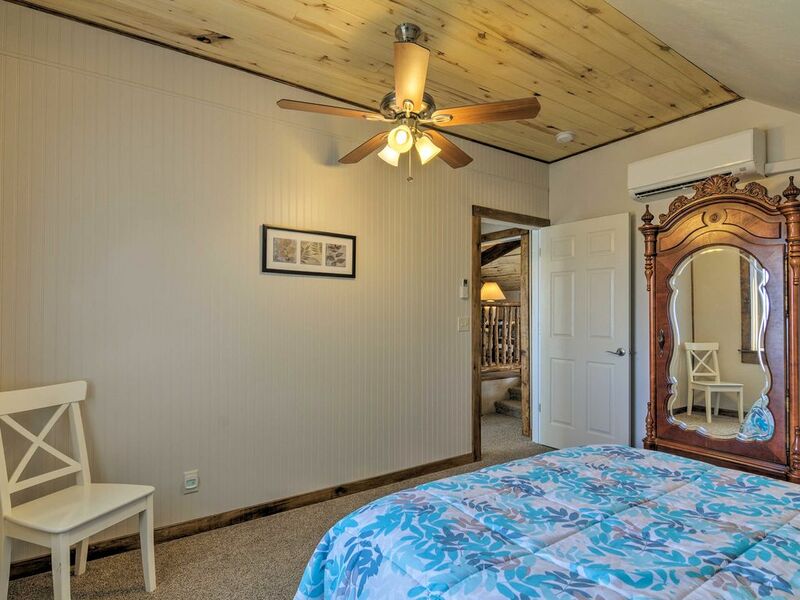 The second bedroom at Sunrise Hollow feature a comfy queen bed, knotty aspen lined ceiling, a ceiling fan, and private climate control. 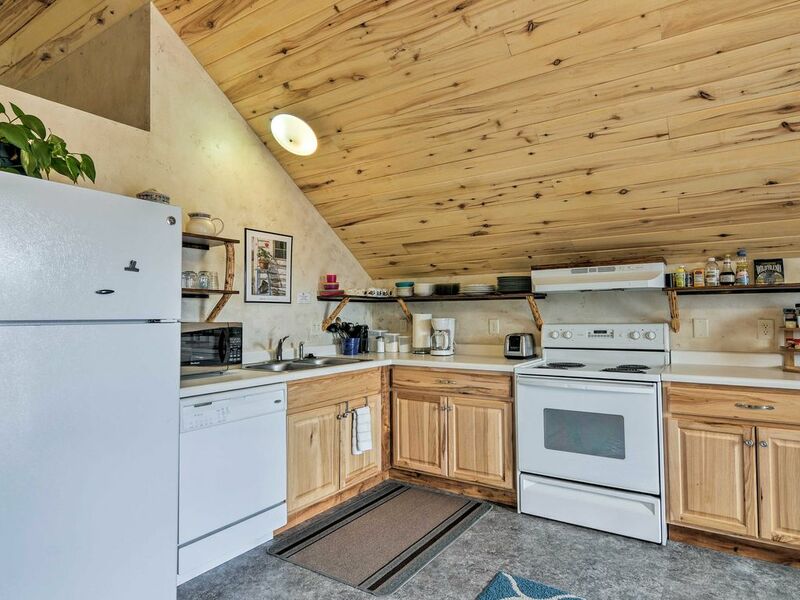 Sunrise Hollow's roomy, fully-stocked kitchen boasts a stove, fridge, microwave, and dishwasher for your cooking convenience. Watch the first pink rays of sunrise light up the rim of Bryce Canyon as you gaze out the lofty windows of this spacious second-story vacation suite. 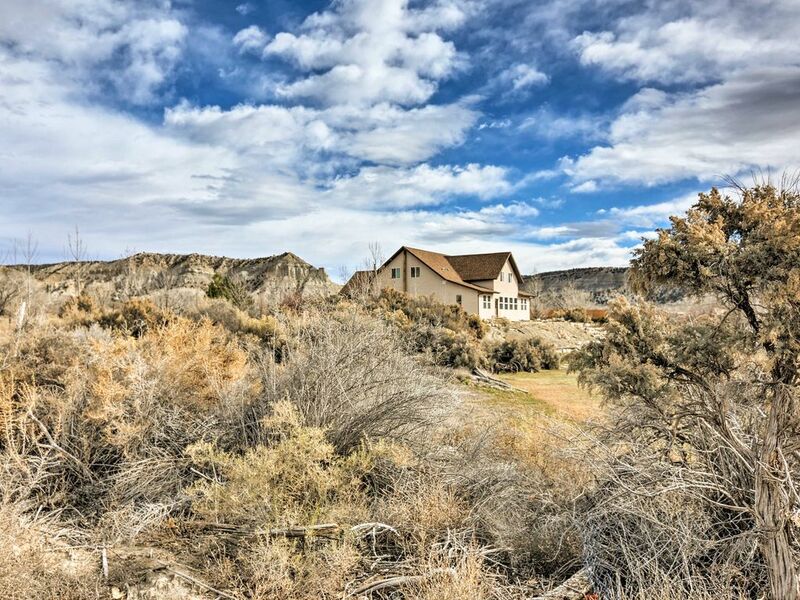 Situated on the edge of Sunrise Hollow in the heart of peaceful Henrieville valley, this large home is nestled between its own little creek and wilderness area on one side and tranquil farm land on the other. Just off Scenic Highway 12, down a private gravel drive and past grandpa’s old pasture, you’ll pass through beautiful flower and vegetable gardens and park in the rear of the home. 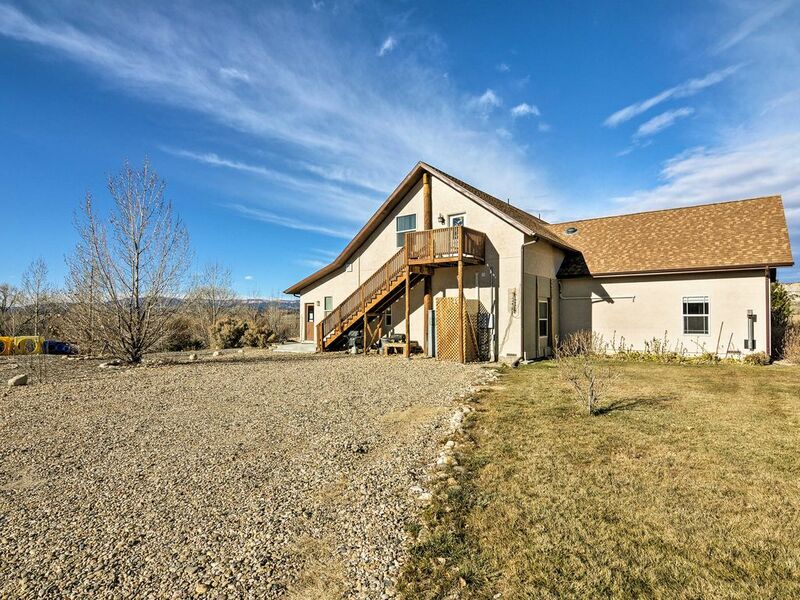 You’ll have private outside stairway access to the second floor with its many windows and panoramic mountain views. The suite’s open floor plan creates a casual, relaxing atmosphere that will accomodate your entire family or group in comfort—or keep the entire suite for just the two of you! Vaulted ceilings, faux antique walls, aspen ceiling, and rustic post and beam accents provide a spacious, homey feeling throughout. 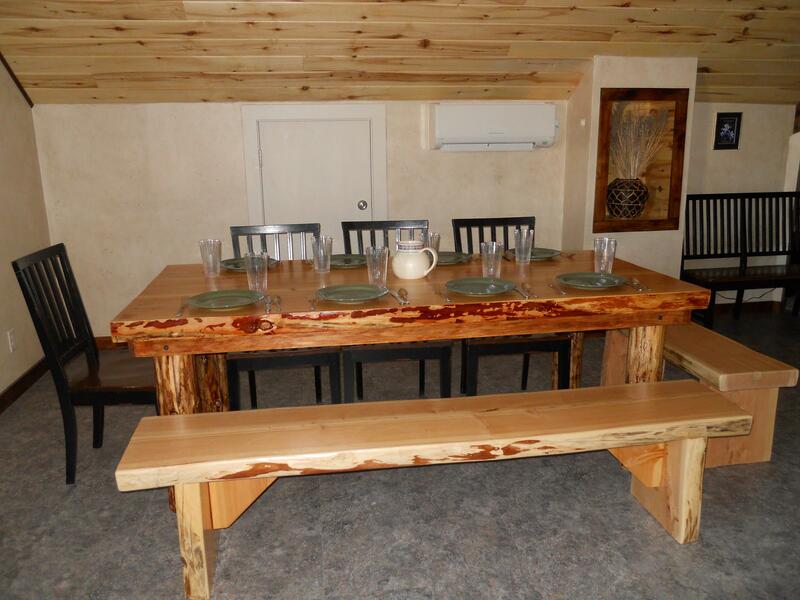 You can cook your own meals in the fully furnished kitchen, or eat out at one of several seasonal restaurants nearby. You’ll find the two full baths and washer/dryer handy for cleaning up after a long day of outdoor excitement. When you return to the house to rest from your adventures, curl up on the leather couches in the great room to watch a favorite movie on the flat-screen TV and DVD player, or surf the web and send pictures of your unforgettable experiences to your friends and family at home using the free wi-fi access. One of the bedrooms features a secret play area the little kids will love to come home to. Outside your getaway home is a large, grassy area for your recreational use. Kids will enjoy playing games on the grass, going down the sixteen-foot tube slide, or wading in the nearby creek. Soak in the ambiance of warm summer evenings around the outdoor fire pit as you toast marshmallows and watch the stars appear. Your memories of this rural home setting will make you want to return again and again! 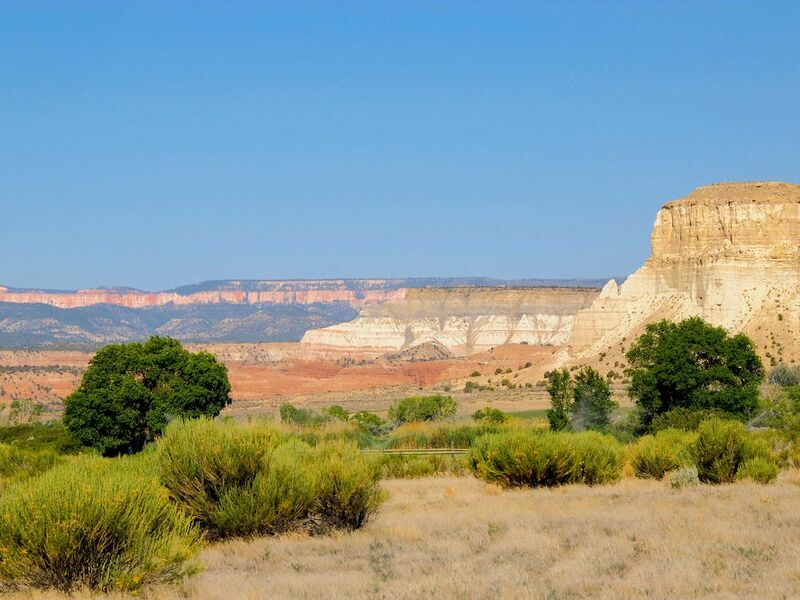 Located in the center of Utah’s red rock country, you will find some of the most breathtaking views in America within easy driving distance. In addition to seeing the wonders of Bryce Canyon National Park and the Grand Staircase National Monument, many outdoor activities are available nearby, such as hiking trails and slot canyons, biking, canyoneering, horseback riding, fishing, wildlife viewing, and ATV tours.